Home NEWS Dad’s pain of losing daughter joining Nairobi University to accident. Dad’s pain of losing daughter joining Nairobi University to accident. James Matheri, Caroline's father (centre), shows to the press the van that took away his daughter's life on Monday as she was preparing to join University of Nairobi for her Bacheror's of Arts degree in the faculty of social worker. A 17-year old girl who was set to join the University of Nairobi in a few days had her dreams crashed on Monday after she was ran over by a PSV matatu near Cravers Inn in Thika Town. Caroline Matheri’s big day crumbled at around 6:30am as she was leaving her brother’s house to board a matatu to town for an appointment to get her medical certificate at the Thika Level 5 Hospital. According to eyewitnesses, Caroline had just crossed the exit road to Nairobi and was about to join other commuters who were waiting for a bus to Thika across the road when the ill-fated matatu attempted to overtake another vehicle from the left side of its lane. “The first vehicle had already given way to Caroline and had actually shown indication to show the intentions of its driver. Suddenly, this matatu overtook it from the wrong side, bumping on the girl who by then had been shielded by the first vehicle,” explained the eyewitness who happened to be a bodaboda rider who was passing nearby. The girl died on the spot as the driver of the matatu sped off and vanished in thin air. 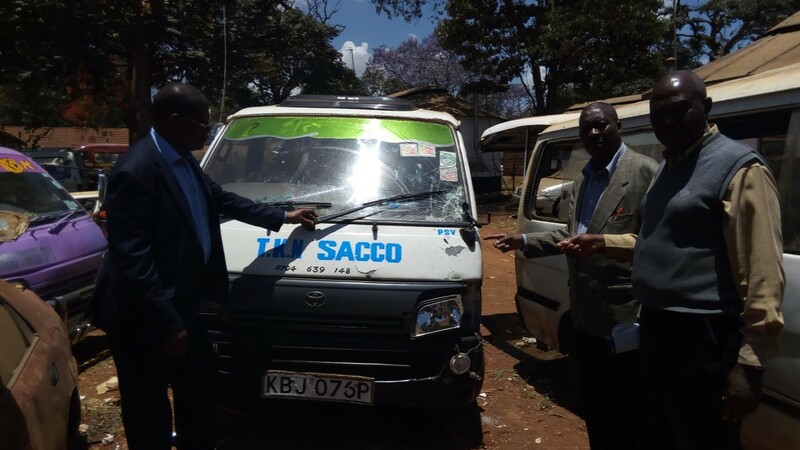 Luckily, those who were in the vicinity managed to pick its registration number and the name of the SACCO it operated from. From her personal effects, the shocked on lookers were able to obtain her details and called her father who in turn informed her brother. “I was away on duty and so when I received this call, I called her brother, instructing him to rush to the scene. A few minutes later, my son called me back to relay the sad news of her demise,” said the distraught father Mr. James Matheri. James called a friend who lives in Thika to assist him follow up the case as he made arrangements to come to Thika. “Upon receiving the details of the vehicle, my friend called one of their officials who helped them trace the matatu hidden at its owner’s home in Kandara. They also ensured that the driver availed himself at the Thika Police Station to record a statement,” said James. He reckons that his daughter’s life might have been saved if at all she was immediately rushed to hospital. Sources intimate that the driver is out on a free bond awaiting police investigations to ascertain the circumstances that led to the accident. The body of the deceased in lying at General Kago Funeral Home awaiting post mortem and eventual burial at their Makuyu rural home.